Although challenging at times, following a healthy lifestyle is not an impossible feat to achieve. 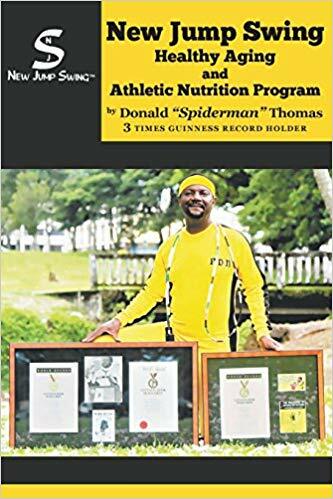 Author and three-time Guinness World Records title holder Donald “Spiderman” Thomas presents an effective program, “New Jump Swing,” for those seeking to improve and maintain health. After being diagnosed with both respiratory disease and Osgood-Schlatter knee disease during his childhood, Thomas developed an interest in biochemistry and rehabilitation while looking for ways to strengthen his body. Taking inspiration from the late Bruce Lee’s “Tao of Jeet Kune Do,” he designed a health and fitness program that aims to acquire and preserve youthful vigor throughout life. The book, the revised and updated version of his three world records speeches, highlights Thomas’s knowledge, expertise, and experience on aging, geriatrics, and mental health rehabilitation and administration, with clinical research to support his insights. By sharing his program, the 65-year-old Thomas hopes to encourage people to pay attention to their health and work on keeping their bodies running. “It will benefit the athlete in training as much as the senior citizen, businessperson, housewife, or teenager,” he says. “New Jump Swing” is an informative guide for all ages. Copies are available for purchase at selected online bookstores. More information on Thomas and his work is available on his website, www.booksbydonaldthomas.com. Born September 21, 1953, Donald “Spiderman” Thomas is a native of Brooklyn, New York, and has lived in Hawaii since 1981. Along with his two Guinness World Records in after-dinner speaking based upon books that he’s authored, he also holds the record for the longest sermon, which lasted for 93 consecutive hours from September 18 to 22, 1978. Recognized as one of the pioneers in the fields of sports nutrition, minority health disparities, and healthy aging, Thomas is a sought-after lecturer and personal health consultant internationally.